Posted on 21st July 2015 at 12:11 pm. Nestled in the heart of Mayfair in the West End of London, the latest addition to our range of meeting rooms is ideal for appointments with high profile clients. These contemporary meeting rooms are situated in a beautiful traditional building in Berkeley Square. All the meeting rooms have rooftop views over Mayfair and West London. 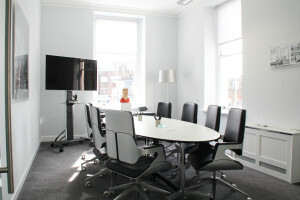 At London Meeting Rooms we offer a selection of meeting rooms across Central London. As well as our Mayfair meeting rooms, we also have meeting rooms in Holborn, Euston, Kings Cross, Marble Arch, Oxford Street and Hyde Park. 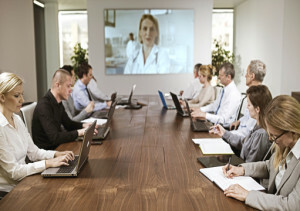 We also offer video conferencing facilities. Our Mayfair meeting rooms are ideally situated close to Green Park and Bond Street underground stations. West End theatres, restaurants, hotels and famous shopping havens: Bond Street, Regent Street, Oxford Street, Piccadily and Saville Row are just around the corner. There are two meeting rooms available at our Mayfair venue: Fleming and Hemingway. Both have a boardroom layout and can seat up to eight people. The rooms are available at £95 per hour, £295 for a half day or £495 for a full day. As with all our meeting rooms we offer free internet access, staffed reception, audio-visual equipment, flipcharts, copying facilities and a host of catering options including breakfast, lunch, tea, coffee, water, soft drinks and snacks. Posted on 7th July 2015 at 8:34 pm. 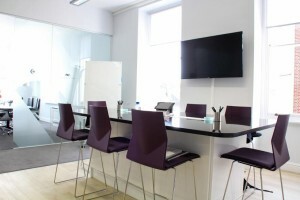 Here at London Meeting Rooms we offer a number of meeting rooms across central London. Meetings are notorious for wasting valuable company time. There’s a saying that “a meeting is an event at which the minutes are kept and the hours are lost.” – 100 Funny Business Quotes Follow our top tips to get the most from your meetings, ensure they’re productive and avoid wasting time. Meeting Rooms in London. Click here to book now. 1. Have a clear objective for the meeting and check if it is really needed. Define your goals for the meeting before you call it. This will help to prevent unnecessary meetings. 2. Have an agenda and stick to it. This will help to ensure that the goals for the meeting are achieved. 3. Take minutes detailing what action will be taken, by whom and by when. 4. Only invite people to attend that need to be there. Staff that are just there for the sake of it may resent wasting time attending a meeting where they’re not needed. Plus, it’s not the best use of company resources. 5. Start and end the meeting on time. Allocate a specific amount of time for the meeting and each point on the agenda and make sure that is adhered to. 6. Have a chairperson who takes ownership of the meeting and keeps it on track. 7. Only use PowerPoint slides if they add value. Avoid using slides that state the obvious. Proofread slides and avoid spelling or grammatical errors. Everyone’s time is valuable. Following these tips will help ensure that time taken for meetings is used effectively and that the objectives of the meeting are achieved. For effective meetings, book one of our meeting rooms, conveniently located across central London. 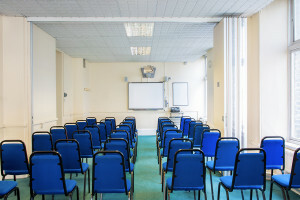 We can also provide refreshments, audio visual equipment, reception staff, video conferences and a high-speed internet connection. Posted on 7th July 2015 at 8:32 pm. At London Meeting Rooms we have a wide range of meeting rooms available across a number of central London locations. We have recently added three new meeting room venues conveniently located at Holborn, Euston and Kings Cross. The new venues are ideally located a stone’s throw from London Euston, Kings Cross, Holborn and Russell Square stations and are therefore ideal for commuters coming into the capital. 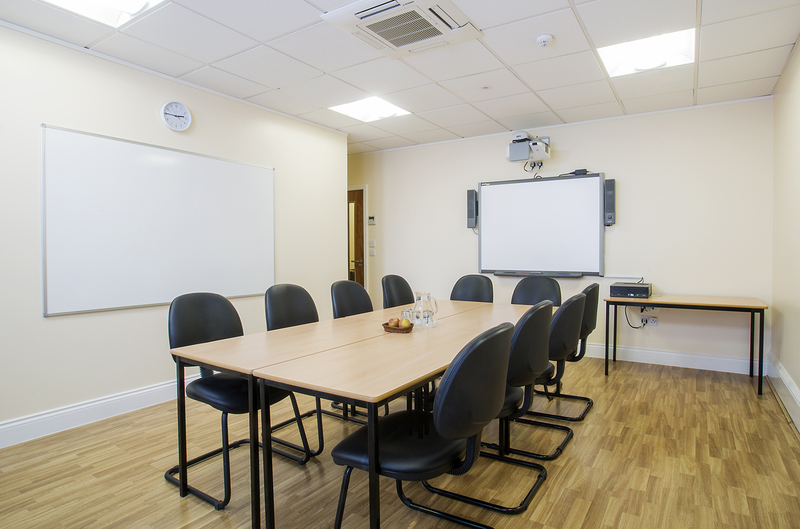 In addition, they are extremely good value for money, with meeting rooms starting from just £27 per hour. We have three meeting rooms available at this location with space for between four and fourteen people. These meeting room venues offer complimentary WI-FI, whiteboards, projector screens for presentations via wireless keyboard & mouse. The Holborn venue has a large cafeteria for light snacks, working lunch, hot buffets & beverages for delegates. Directions: our Holborn, Euston and Kings Cross meeting rooms are located just a 4-minute taxi ride from Kings Cross and Euston train stations or a 6 minute walk from Holborn and Russell Square underground stations. Posted on 7th July 2015 at 8:31 pm. London is the obvious place to arrange meetings, whether it be with clients, prospects, staff or suppliers. For companies that don’t have offices in London, there are range of meeting rooms and venues on offer. 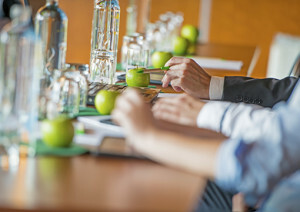 Follow our five top tips to find the best meeting venue for you. Location is the most obvious consideration when choosing a meeting room venue. Think about where the attendees will be coming from and which London station they will arrive at. 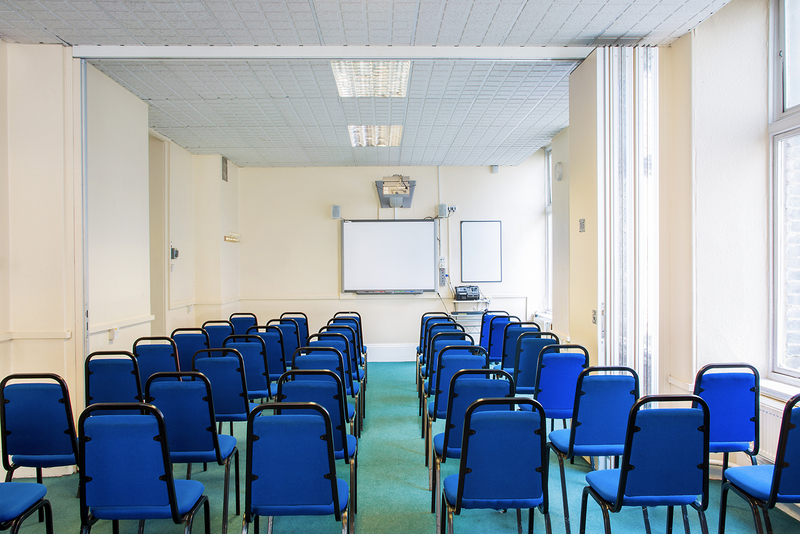 Choose a location that’s central for all attendees and close to a London Underground station. It’s important to give a good impression, especially if you’re meeting with prospects, so choose a venue in a high quality building with smart furniture that’s in good condition. Although most businesses will not sacrifice quality for price, it is still obviously an important consideration. You should be able to hire a meeting room either by the hour or for a half or full day. It’s important to check in advance that everything is available, including projectors, flip charts and WIFI. Some meetings or trainings will require all delegates be able to access the internet. Check the WIFI strength in advance and ensure that it is adequate. Will you be providing refreshments for your delegates? If so, it’s important to find out what refreshments are available at the venue, as well as the cost of refreshments. At London Meeting Rooms, we provide meeting rooms across a variety of locations in Central London. All our meeting rooms are of the highest quality and available at competitive rates.